Weekly Woot & Grumble: Birthday, Beer, BBQ! It only seems right that today’s woot be in honor of my very own Mr. Frugalwoods’ birthday! He turned 31 earlier this week and I was reminded of how thankful I am that he was born. He is my soulmate, my partner in every sense, and a hilarious guy to boot. I’m also tremendously grateful that he wanted to celebrate 31 in typical frugal weirdo fashion. His birthday cost us a grand total of: $65.57 ($37.25 for his bday gift of beer + $28.32 for our BBQ dinner). The first element of his birthday revelry was a sojourn to the Craft Beer Cellar where Mr. FW browsed to his heart’s content. 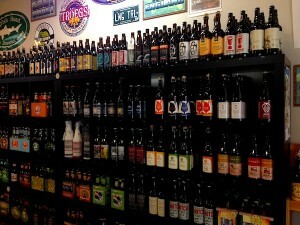 If you’re in the Boston area, it’s an amazing local bottle shop in Belmont. He had geeked-out beer conversations with several other dudes and we were there for so long that we got to enjoy three different free tastings! Mr. FW selected the limited-edition Sierra Nevada Beer Camp for his birthday specialty beer and we stocked up on Founder’s All Day IPA, Stone’s Go To IPA, and Two Roads’ Worker’s Comp Saison (that was my pick) for general sippin’ purposes over the next few months. We then trekked over to Blue Ribbon BBQ (again, Boston peeps, this is an incredibly tasty, local joint in Arlington & Newton). To save on dining-in costs, we got take-out: East Carolina, vinegar-based BBQ platters with collards, baked beans, potato salad, cornbread, and mac-n-cheese sides. Let me tell you, we ate that for no less than THREE meals. It was divine. Mr. FW’s people (as they say in the South) hail from–and still live in–Eastern North Carolina so I’ve been indoctrinated in the virtues of vinegar-based ‘cue. We won’t eat any other kind. Ok this didn’t photograph well, but, here’s the amazing BBQ! This birthday is just another example of how we enjoy life, live well, and do what we want frugally. 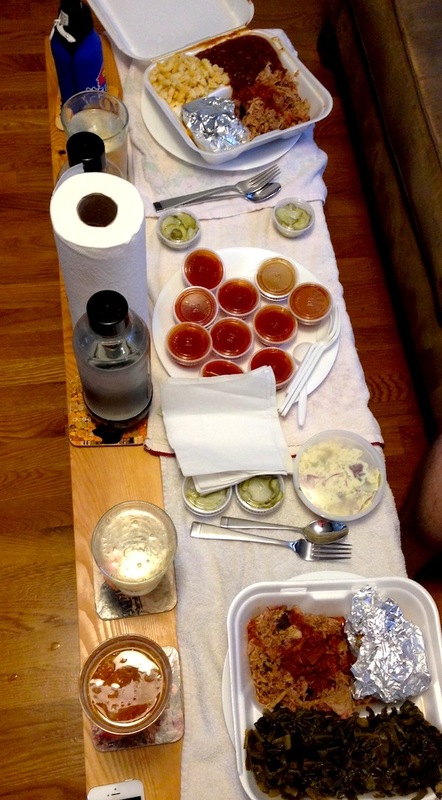 Also, since we very rarely eat out, it was a real treat for us to get take-out. We’re easily impressed and entertained, not jaded by endless spending and lifestyle inflation. I’ve said it before, but it bears repeating that being on the same page financially benefits every aspect of our lives and our marriage. We don’t have tension or arguments over how much to spend and I didn’t feel any pressure to seek out the “perfect” expensive gift for my husband. I knew that I could ask him what he wanted for his birthday and he’d respond honestly–in this case, craft beer & BBQ. Though come to think of it, I’m actually pretty sure we did the exact same thing for his birthday last year… hmmm, creatures of habit much? I love this man! *Mr. FW made scrumptious blueberry scones from scratch for a little gathering of friends we had on Saturday. They were delicious and I ate, I think, 6 of them in total. I’m bad news around baked goods. Mr. FW’s scones! I’m ashamed at how many of these I ate. Not really, they were awesome. I’m currently binge eating carrots and peanut butter because I can’t think of a single thing to grumble about, which in and of itself is a WOOT! Inflating grocery store prices. Costco raised the price of bulk quinoa (by $2! ), limes, and frozen pizza! Boo. We decided to skip buying the quinoa to see if perhaps the price returns to normal next month. The fact that we haven’t been able to hike as much this summer as we would like. We’d be happiest if we hiked every single day. So, it’s a good thing we’re planning on buying a homestead in the woods. The way that Frugal Hound drinks water from her bowl. It’s essentially a cascade of water. More water gets on our wood floor than in her mouth. She sticks her looooonnng snout deep in the water and sort of thrashes about. I hope she’s not permanently dehydrated. Oh and then she walks away leaving a trail of water (again, ON the wood floor). Yes, I am an awkward hound and I can’t drink water properly. Clearly none of these merit a fully-fledged grumble. I leave you with an image of the current tableau of Frugalwoods life: me and Mr. FW sitting at our farm wood dining room table ($75 on Craigslist), surrounded by seltzer (no one is surprised about that), carrots, and peanut butter. Frugal Hound is grunting in her sleep in the other room and there’s a beautiful autumnally-tinged breeze coming through our open doors and windows. Basically, we’re loving the frugal life. Have a great weekend, friends! How do you celebrate birthdays? Happy Birthday to Mr. FW. 🙂 Our birthday celebration are pretty low-key, similar to you. We just do out own thing, either making a nicer dinner, going out to eat, or getting take out. We don’t do much for gifts, though my fiancé gave me a really nice watch last year… My Mom is turning 60 next month, so I’ll be going down for a visit and that’s about it. I’ll just get her a little trinket or something to mark the occasion. My idea is to get a family portrait done because we haven’t had one since I was about 5, and now I’m pretty close to 30. The trick will be getting my brother to agree. Oh, binge eating carrots and PB is my favorite past time!!! Smooth! Oh definitely smooth! The “all natural” kind from Aldi’s! She does look guilty! I don’t remember what she was guilty about, but, I couldn’t get a good photo of her drinking water, so we’ll say that’s a post-water guilt-face. Hoping to hike this weekend! I don’t keep baked/sweets around the house either…they would not stand a chance! If I need a fix, I’ll go out and buy something, usually at Starbucks. Happy Birthday to Mr. Frugalwoods. My birthday is coming up in a couple of weeks and I keep reminding the DH that I don’t want or need any gifts. I hope he listens but I seriously doubt he will lol. Happy Birthday Mr. FW!!!! Sounds like you had an awesome day! Me and FB Hubby do the same thing every year on our birthdays. He makes me my favorite meal and I make him his. For a gift we each typically just like a bottle of wine. For me it typically has bubbles and for Hubby it’s a red. Neither cost more than $20. I hope that you, the Mr and Hound have a wonderful weekend and hopefully get to enjoy this beautiful weather!! Thanks so much, Shannon! Best wishes for a lovely weekend to you, FB Hubby, your little guy, and Spumoni! Happy Birthday to Mr. FW! Sounds like you guys had a lot of fun. We’re also easily entertained – so much so, there’s no entertainment category in our budget. If Mr. FW has any neat insights about NC I’d appreciate it. We’re in Charlotte, so not the coast, but we need to get out and explore this state! 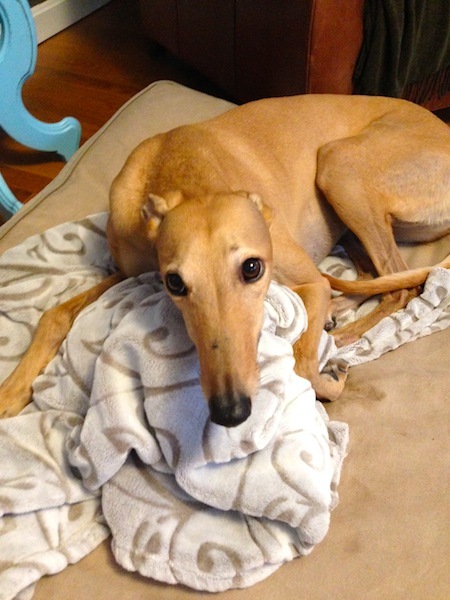 Aww, Frugal Hound looks so comfy! Our kitten is the same way…she eats, and leaves a mess behind. All the time. She drinks awkwardly, too. Actually, she lays in all sorts of awkward positions, so I guess that’s not surprising. I’m also the same way with baked goods. My mom made chocolate chip cookies when we were visiting and I had at least 7 that night. Oops. Have a great weekend! I didn’t realize you were in Charlotte! We love Asheville, NC–have you been there? Highly recommend it. And Mr. FW’s family often vacations at Seabrooke Island in SC, which is beautiful. We were sad not to go with them this year :(. Founders All-Day IPA is rad, especially when it’s $15 for 15 cans. I have a similar weakness for baked goods. Lately I’ve been making zucchini bread with zukes from the garden. 1 9×9 and two regular loaves. The whole batch lasts maybe 3 days. Glad Mr FW had a good birthday! Founders is indeed quite rad :). Happy birthday to you too! We went hiking today, so sort of a delayed bday hike celebration for Mr. FW. You already know how I feel about the zucchini bread–YUM. Happy birthday to the man of the house! Sounds like he had a great birthday. I wish I could try out the beers you mentioned. You seem to have completely different kinds of beer in the US! And you were telling me you were jealous of my fries? 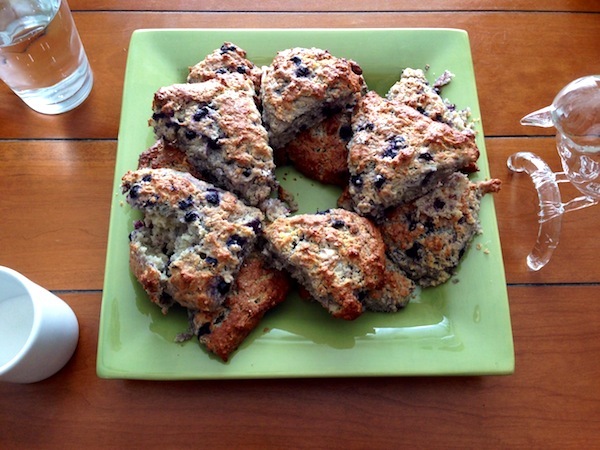 Look at those blueberry scones! Drool, drool. Actually, the last time I went to the craft beer store was also on my birthday 5 months ago, so I’m a little jealous. I made cranberry scones today, but not for a party. Just for us! Lime prices went crazy everywhere recently. They were a dollar each at the grocery store a month ago maybe, but they’ve since come back down. And yes, our greyhound gets water all over the floor. I put a mat under her water bowl, but it still doesn’t cover the immense square footage she manages to slobber on. Happy B-Day Mr. Frugalwoods. I love frugal hound. Sounds crazy but I have never seen a greyhound in real life – only pictures and a Simpsons cartoon. Didn’t realize they were such cute dogs. I will have to find your pinterest board. Happy B-day! I love Blue Ribbon (well I did when I was in Boston, now I only get it on trips through town, that and Anna’s burritos). Our dog gets water everywhere too, but that’s because his “beard” gets wet and then it drips everywhere. Sounds like an awesome birthday! I’m glad to hear you all had a great time. And yes- being frugal definitely makes the occasions in which you spend money that much more special. I can only imagine how jaded I would be if we went out to dinner 4x per week. And dogs with their freaking water bowls! Anytime she’s tired from playing our walking, she will lay by the bowl, drink, and her giant spoon tongue just throws water within anywhere within a 4-ft radius. But, it’s still kinda cute. Haha–I’m picturing your hound lazily lapping away. When we’re hiking or on a picnic, I have to hold Frugal Hound’s water bowl up for her to drink and I get soaked! Agree on the novelty of spending money–helps combat lifestyle inflation too! Wonderful imagery! I do not like the intense heat of summer, so very much look forward to the change of season at the end of summer. Plus, those cooler temps mean that snowboard season is close. Mrs. 1500 gets trapped in liquor stores too for much longer than she’d like. Same goes for me in thrift stores, so it all evens out. We are NOT hot weather people either! I’ve never been snowboarding before, although my brother is quite good at it. I’m intrigued, but also terrified. Hah–you two are just like us–my favorite thrift store is actually RIGHT next door to the craft beer cellar and so we usually trade off on waiting for each other. But not this time: I’m on a self-imposed “no clothes purchasing” for all of 2014 (which I’m succeeding at so far). And also, I sniff (shout out to FH) a business idea! A thrift store with a little tasting room in back*! Let the shopper shop and the drinker drink. It is a win-win! Insanity aside, something along similar lines just opened here in Longmont. They sell shoes and beer: http://shoesbrews.com/ Ooo ooo ooo, I think that is Longs Peak and Mt. Meeker on their homepage, but I digress. So, we have old clothes + beer. Shoes + beer. Does anything not go with beer? I have no idea what I originally set out to type. Good night. Oh, I remember now. Snowboarding is great! Give it a shot. Your first day will be painful, but it gets better after that. With all of the money you’re saving on clothes, you can pick up a used board at the thrift store. Mr. FW has had that exact same business idea. To be fair, he thinks pairing beer with anything is a good business idea and I’m inclined to agree! We really want to get into winter sports more, so far we only winter hike. We’ve never snowshoed or cross country skied either–should really rectify that this year!